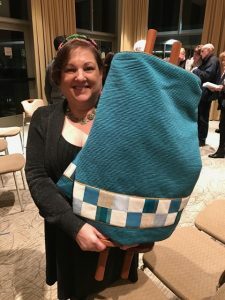 Linda’s talk, titled “A Year in the Life of a Torah,” will focus on the process of writing a new sefer Torah (the Torah scroll), from commission to siyyuum (completion and dedication). Among the topics she will cover are getting to know a congregation, ordering materials, the kickoff, scribing with members of a congregation, balancing writing and life, and writing as personal therapy. Our Personal Giving Thank-You Brunch is open to anyone who makes a donation to the Personal Giving campaign. If you haven’t yet donated to the campaign, attend Linda’s talk, please contact Dorothy Cohen, at dorothy_irvingcohen@msn.com.